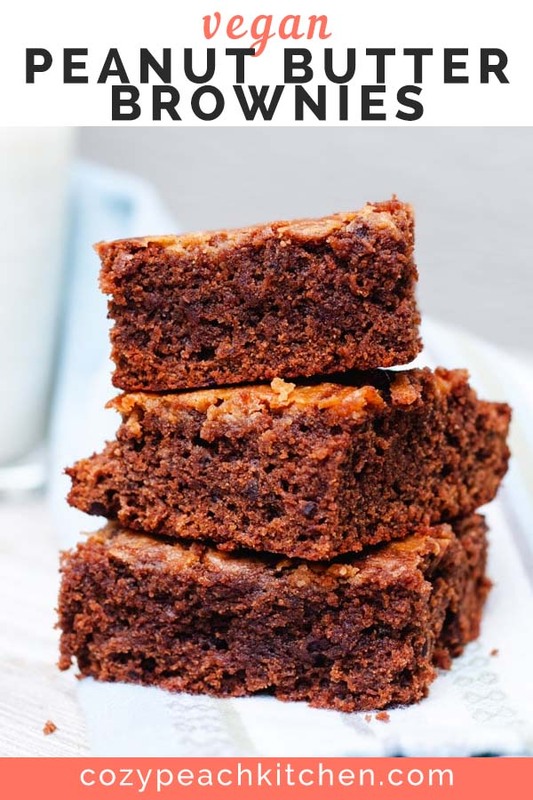 These thick and fudgy vegan peanut butter brownies are packed with peanut butter from the inside out. They’re mixed together in one bowl using cocoa powder and classic brownie ingredients. 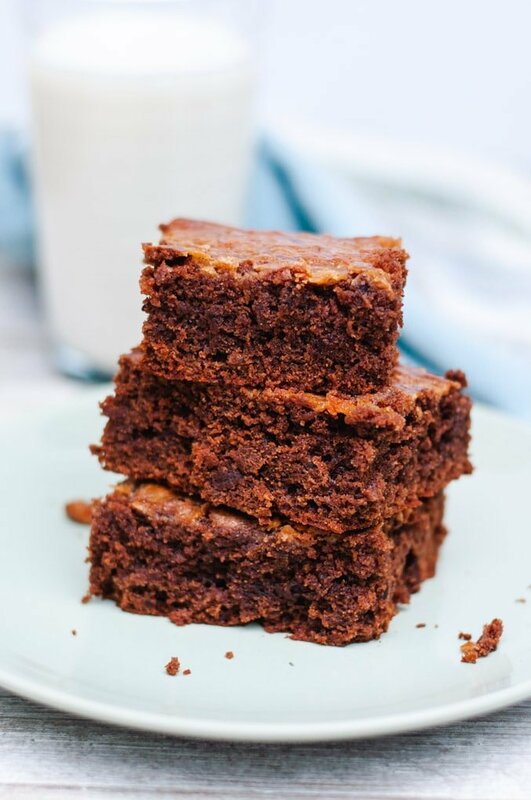 Peanut butter flavor comes through with every bite in these soft, fudgy chocolate peanut butter brownies. And as if chocolate and peanut butter on the inside of a brownie isn’t enough, check out this peanut butter swirl on top! I was inspired by Isa Chandra, one of my favorite vegan chefs. Everything she makes is golden! 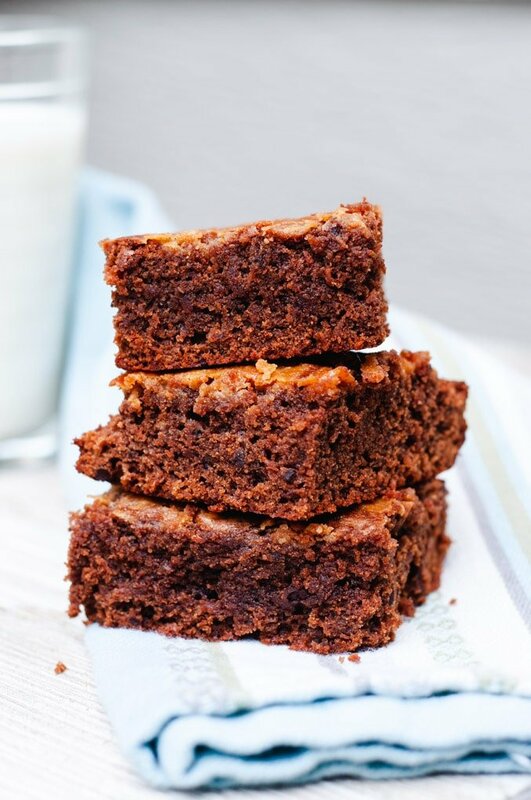 Don’t let the addition of peanut butter fool you into thinking this recipe is a healthy spin on traditional brownies. It’s not (sorry). These brownies use only classic ingredients, like sugar (organic is used to assure that it’s vegan), all-purpose flour, and cocoa powder. No black beans or tofu here, just deliciously indulgent brownies made the old-fashioned way. Brownies should be easy to make. If you’re like me, you enjoy making brownies as a last minute treat. Really, the majority of the time that I make brownies it’s on the spur of the moment. Sometimes you just have to answer to a comfort food craving! That’s why this recipe uses straight-forward, common ingredients, just like those classic fudgy box mix brownies. That way, when brownie making time calls you hopefully already have the ingredients in your pantry! 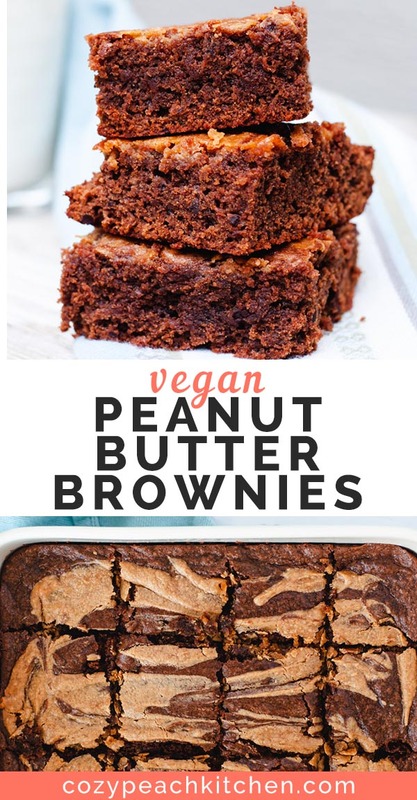 How do you make vegan peanut butter brownies? In a medium mixing bowl, stir together the dry ingredients. Pour in the wet ingredients, mixing until a batter forms. Ta-da! Brownie batter for ooey-gooey brownies. The peanut butter swirl may look fancy, but it’s super easy to make. 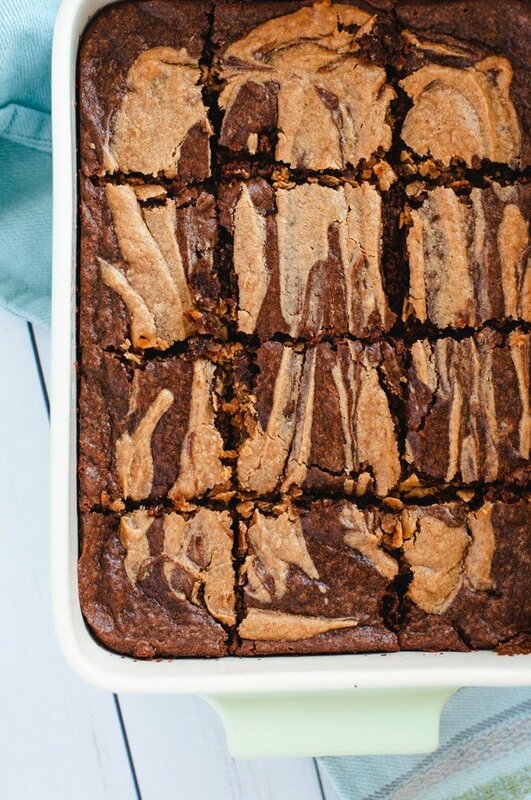 Drizzle the peanut butter swirl “sauce” on the brownies in four lines. Pull a knife through the lines to make a swirl. Or freestyle your swirl and pour it into whatever swirls and lines your heart desires! Sweet tooth not yet satisfied? These vegan dark chocolate peanut butter cookies are another of my favorite chocolate peanut butter treats. A side note: If you aren’t vegan, this recipe can be made using eggs instead of flax eggs. 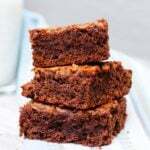 I tested this recipe out with a few different variations and found that the eggs give the brownies a fluffier, cakier texture, whereas the flax eggs increase the density of the brownies. Both results are ooey gooey and beyond delicious. 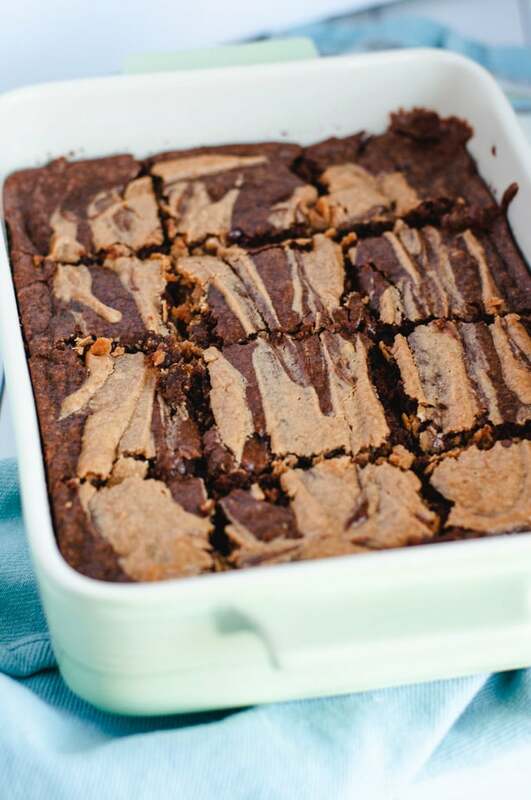 These thick and fudgy vegan peanut butter brownies made with peanut butter AND have a peanut butter drizzle on top! Preheat the oven to 350 degrees F. Lightly grease an 8x8 inch baking dish with cooking spray. Make your flax egg by combining the flax seed and water in a small bowl. Let set for 5 minutes before using. 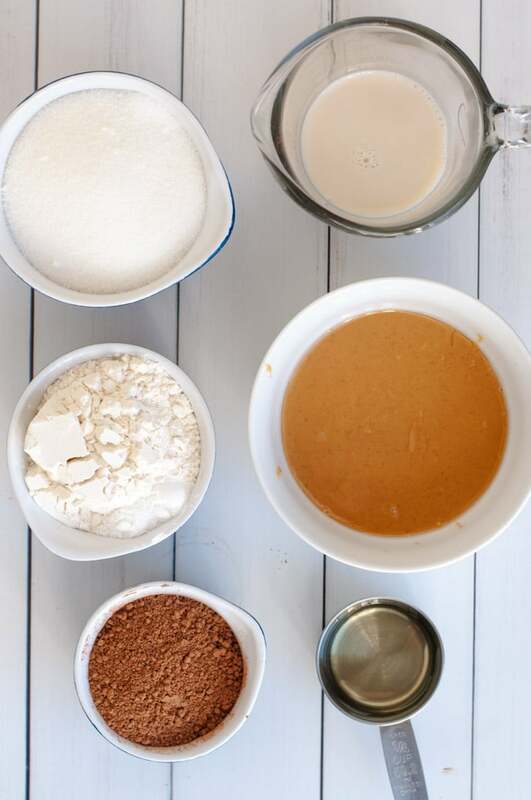 Mix together the dry ingredients in a medium mixing bowl: sugar, cocoa powder, flour, baking powder, and salt. Pour in the wet ingredients: peanut butter, canola oil, non-dairy milk, flax eggs. Mix until a thick but spreadable batter forms. Spread the brownie batter into the greased 8x8 inch pan. Mix together the peanut butter swirl ingredients, adding additional milk as needed to make drizzle-able. Drizzle over the brownies in lines. Drag a knife through the lines to make swirls. Bake in the oven for 35-40 minutes, or until a toothpick inserted in the center comes out clean. Let brownies cool before slicing. Enjoy! I recommend using natural peanut butter because that's the only kind I used during recipe testing. Regular peanut butter will likely yield similar results but hasn't been tested. 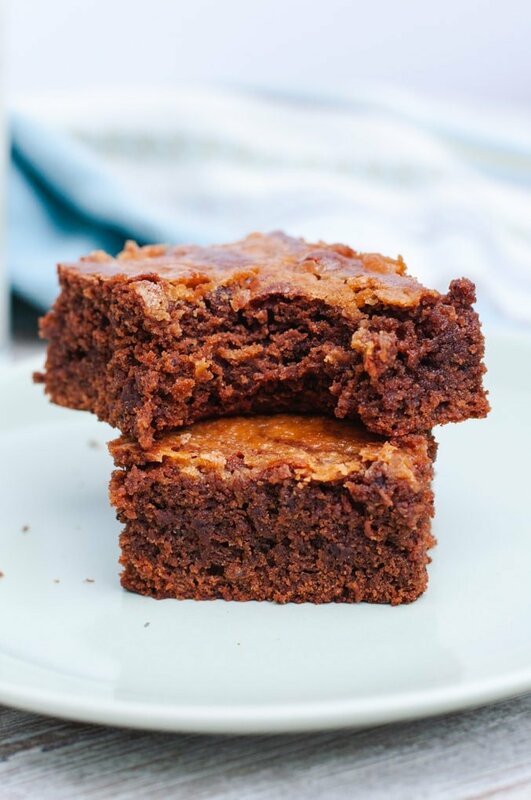 An 8x8 inch baking pan makes thicker brownies that take 35-40 minutes to bake through. If you use a 9x13 pan you'll want to decrease the baking time to 30-35 minutes. Always make sure to test the center with a toothpick to confirm the brownies are baked through. Can I sub canola oil for olive oil? Yes, you can use olive oil instead of canola. Enjoy!